One of this summer's most unlikely dynamite acting duke-outs comes courtesy of Woody Allen's latest, "Blue Jasmine," a bicoastal drama with flashes of humor and transparent undertones of "A Streetcar Named Desire" that features the latest in the director's long line of compelling yet complicated leading ladies. In this corner, joining the ranks of such delightfully difficult divas as Penelope Cruz ("Vicky Cristina Barcelona") and Judy Davis ("Husbands and Wives"), is that thespian thunder from Down Under, Cate Blanchett. Swank and svelte in increasingly rumpled Chanel, she plays a disgraced, displaced and utterly delusional Manhattan socialite whose designer-brand lifestyle implodes after moving into her sister's downscale San Francisco home. In the opposite corner is Brooklyn-bred Andrew Dice Clay, that '80s-vintage foul-mouthed Fonzie, as Jasmine's burly blue-collar ex-brother-in-law. When Clay's Augie eventually crushes the hopes of Blanchett's Jasmine—much as her investment schemer husband, Hal (Alec Baldwin, at home in slick slimeball mode), ruined Augie's financial dreams—it's as if you're watching Blanche DuBois and Stanley Kowalski spar in an Almodovar film inspired by the travails of Ruth Madoff, wife of the infamous swindler to the stars. Such oddball casting—heavy on big-galoot types, with an appearance by comic-of-the-moment Louis C.K.—is just one of the intoxicating reasons that Allen's latest annual offering to the cinema gods feels more substantial (a pet word tossed around by Blanchett's character) than some of his recent work. "Blue Jasmine" might have some disconnects in the plotting department, but its focus on the lies we tell ourselves and others just to get through each day packs a relevant punch. Blanchett fabulously goes above and beyond her duties as the wilting faux flower of the title. From her sweat-drenched underarms during a particularly intense meltdown to her mesmerizing slit-eyed sensuality whenever Jasmine gets her way, the actress is a tour-de-force tinted-blonde tornado that elevates her every encounter with a member of the movie's estimable ensemble. Basically, the Aussie Oscar winner, who just may get a chance at another trophy with this electric performance that makes an essentially despicable woman utterly fascinating as she sidesteps reality at every turn, does what few other Allen leads are able to do: Break through the artifice that often hangs over the director's films, much of it having to do with the distinctive comic cadence of his dialogue. It almost makes you forget you are watching a Woody Allen film, especially when the San Francisco scenes depict the dingy areas of the city beyond the realm of tourist traps. The initial situation will prove irresistible for those who like a good culture clash between the classes. Fortified by fists full of Xanax, guzzles of vodka and an impressive set of Louis Vuitton luggage, a now-penniless Jasmine (formerly known as Janette) relies on the kindness not of strangers but of relatives: primarily, her forgiving and upbeat sister Ginger (Sally Hawkins). Ginger is a grocery store clerk with two young sons who gladly allows her snobbish sibling to swan around her cramped quarters as if she were visiting royalty. A lesser actress might be crushed by Blanchett, but the bouncy Brit also scores some triumphs as Ginger begins to question her own choices after Jasmine's arrival. Meanwhile, mentally unstable Jasmine is haunted by the past and so is the film. As her muddled mind flashes back to her luxurious East Coast existence, she realizes that she regularly turned a blind eye to her husband's flaws as a relentless skirt-chaser as well as a heartless crook. Eventually, Jasmine must lower her standards—she thinks she has the right stuff to be an interior designer, but can barely make it through a computer class so she can sign up for online courses—and takes a job as a dental receptionist, tacky posy-splattered smock included. That setup allows the director to provide the film's most horrifyingly amusing Allen-esque sequence: A repelled Blanchett squirming out of the sweaty embrace of her employer, a creep played to the hilt by Michael Stuhlbarg, who tries to romance Jasmine with an offer of nitrous oxide. Allen sometimes fills in too many of the blanks. We are reminded again and again that Ginger and Jasmine are adopted children from different birth parents because they look nothing alike. And sometimes not enough. Wouldn't a smooth operator like Peter Sarsgaard's dashing diplomat with political ambitions who falls for Jasmine's fabricated stories of her upscale lifestyle better investigate the woman he is dating? No matter. 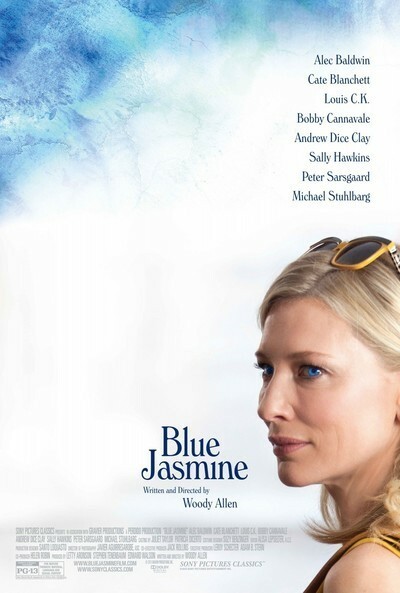 A good Woody Allen flick is a thing of joy these days and, at times, "Blue Jasmine" is even a great one, close to being an equal to 2005's "Match Point." Let us hope he never stops trying.